Yellow Screen on iPhone 7? Here’s the Fix! 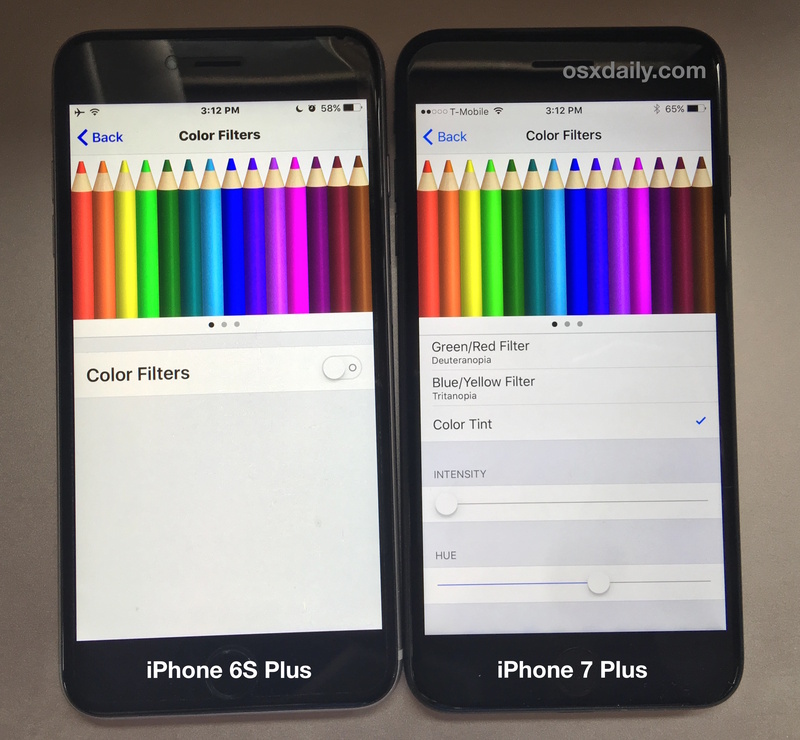 Some iPhone 7 and iPhone 7 Plus screens appear very yellow, or at least seem to display a much warmer color spectrum than what many people were used to on a prior iPhone display. If your new iPhone has a yellow screen or a warmer display, we’ll show you how you can color correct the iPhone display quickly and do away with any yellow screen tint. Before proceeding, realize that on some occasions, select prior iPhone and iPad devices have had a yellow tint to the screen that seemingly resolves itself over a several day period. Supposedly this is because an adhesive on the display is not yet entirely dried, which can cast a slight yellow color hue onto the display. If this is the issue, it should resolve itself just by doing nothing other than waiting a couple of days for that glue to dry. Consider this before adjusting the iPhone display color hue as we’ll cover next. This walkthrough is shown with a brand new iPhone 7 Plus which undoubtedly has a warmer display than an iPhone 6S Plus it is being compared to. But with a simple color hue adjustment, you can actually make it cooler or bluer as desired. Adjusting the color tint intensity and hue should let you quickly get to a display that does not have a yellow tint or warmer hue. You can also easily overdo it and get a very blue cooler screen, or an ultra warm screen, but adjust away according to your own visual preference. 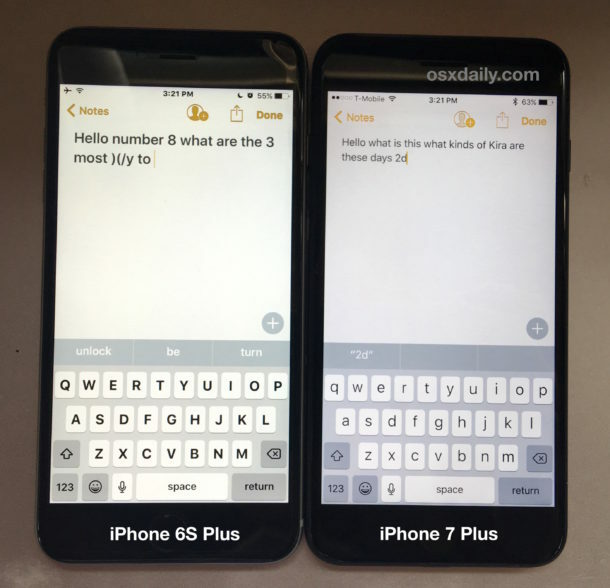 You’ll notice in this picture the iPhone 7 Plus has been probably overly corrected too blue as now the iPhone 6S Plus screen looks yellow. Adjust the Color Tint yourself, you’ll see how it works and how sensitive the color adjustments can be. Do note that if the earlier mentioned adhesive screen glue drying thing is legitimate (and not just a longstanding rumor that seems to recirculate with every iPhone and iPad launch), then your iPhone 7 or iPhone 7 Plus display is probably going to look oddly cooler in a few days, so you’ll probably want to return back to the Color Tint settings and either turn the feature off, or re-adjust it as needed. 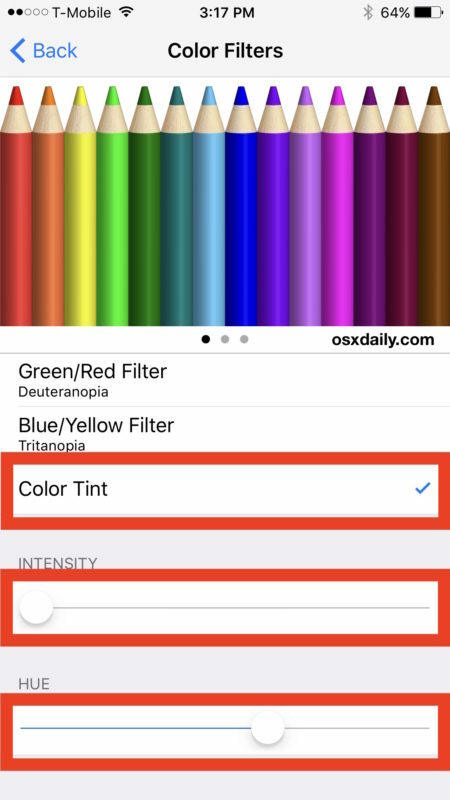 The ability to adjust color tint on the iPhone (or iPad) screen is a new feature to iOS 10 and it’s really quite nice, sort of similar to how calibrating a screen on the Mac works in Expert Mode with precise color adjustments. Since adjusting the screen tint to be slightly more cool seems to do away with this yellow display tint, it makes you wonder if the iPhone 7 and iPhone 7 Plus display was just color calibrated to be warmer to begin with. Time will tell, because if it’s just a yellowish screen glue thing, it’ll go away on it’s own shortly. Did your iPhone 7 or iPhone 7 Plus screen have a yellow tint or warmer hue? Did you use the color adjustment tip to fix it? Let us know in the comments. That seems quite probable, especially since not every iPhone 7 has a yellow screen. I don’t know if the glue thing is true or not, I hear it every time a new iPhone or iPad comes out though. That could be right. My screen is definitely warmer color but with the tint trick I can get it closer to normal. I think more disturbing is the dimness of the display. My iPhone 7 Plus screen is very subdued and not nearly as bright as the screen on my iPhone 6 Plus or even iPhone 5. It looks like the brightness level is stuck at 65% or something, it is a very dim display. 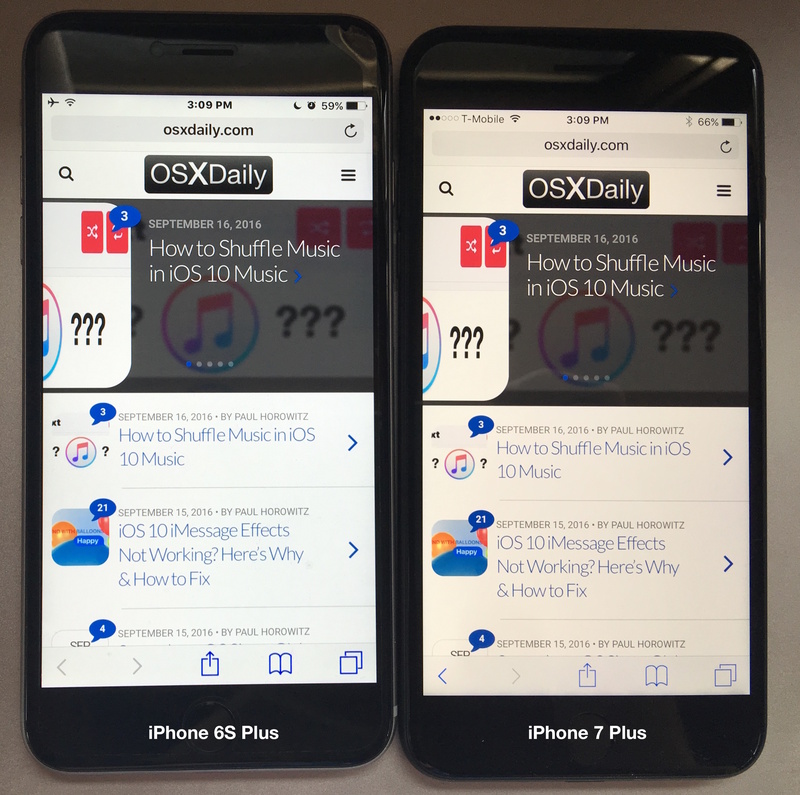 Didn’t Apple market the iPhone 7 as having a 25% BRIGHTER display? It almost looks like a filter is on it or something, it is dim and not particularly sharp either, kind of like the look of an old LCD screen if that makes sense. Rebooted, set up as new, the whole 9 years, still a dim and dull screen on iPhone 7 Plus. Totally agree with you .. Thought I was imagining it until I compared my 6 Plus next to it. Same, I thought I was the crazy one and it has been driving me absolutely crazy because I switched from the Note 7 recall and my wife’s iphone 6 with a smaller screen always looked brighter and richer in color. I was SO confused. This tip definitely helps but I’m still perturbed that Apple did this after talking it up about it’s brightness and color gamut accuracy. What was the other good vendor? Great tip, it worked perfect. My iPhone 7 screen looks very similar to the iPhone 6 it replaced with some adjustment, I didn’t even know the screen could be calibrated like that. I do notice the iPhone 7 screen has a lower contrast and is not nearly as bright though, maybe that is the glue drying? I hope it goes away, otherwise the display looks kind of washed out and dim. Hmm. Neat iPhone otherwise. Loving the camera, Jet Black, and new Home button feels great. This method works, but it’s it calibrating the screen or does it take extra CPU/battery to render the adjustment? Does anyone know if turning on color filters will drain battery faster? Not a big deal but, no QC? I thought that the new 7 was supposed to be 25% brighter than the 6 series. I’m not sure how the phones were set up in the above tests, but the 7 is, if anything, duller than the 6s. Any thoughts on this? this adjustment does not make it identical to ip 6. this does not FIX it. you can even see it in your photo comparisons. misleading. i did it myself on my new 7 and could not duplicate my old 6, maybe to about a 75% match. 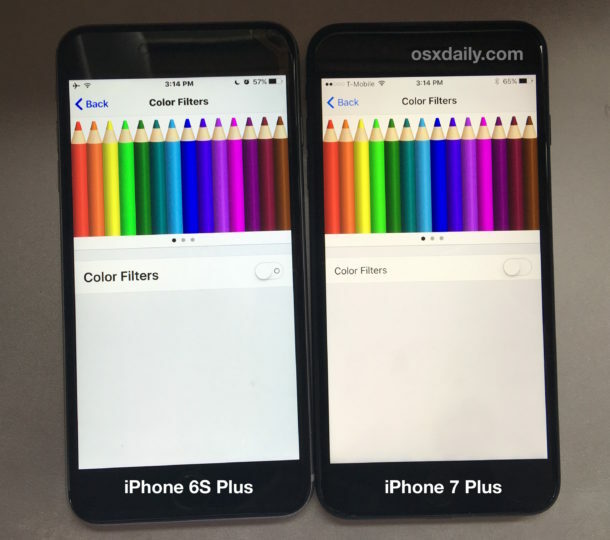 it is either defective, which i highly doubt, or we are just use to color rendering of 6. apple im sure did this on purpose to accurately render true colors better. if we did not have other ip to compare to we would be just happy and fine. I confirm receiving the same. What is funny that, when I got it from one of the operator in Dubai, my device and the operator’s mobile in display have the same issues. When I go to check the devices in an Apple Store or Virgin, they don’t have the same issue. In other words, I believe that it is a specific stock issue. I went to the operator, trying to exchange it, but he refused which is something not logical and not practical as well. I went to Apple store in Dubai and the team confirmed that the screen is yellow and it needs replacement; but a confirmation is needed from the tech. support personnel which is not available now. Frankly, I am very disappointed, especially after losing my day yesterday waiting in queue to purchase it and a lot of time is spent today trying to fix the issue. Even the operator doesn’t have the qualified team to troubleshoot what is the problem. Anyway just to summarize, I am waiting for the tech. support opinion tomorrow (although it is obvious when any one can see it). Although totally disappointed and it wasn’t nice experience, I will update you tomorrow. This is interesting, I wonder if only some iPhone 7 displays are yellow and some are dim? 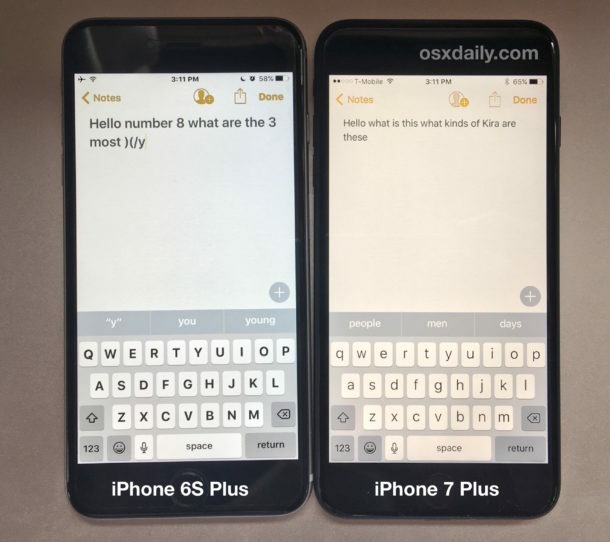 My iPhone 7 Plus display is yellow and the brightness is about 25% less than the iPhone 6s which is exactly the opposite of what Apple advertises. The iPhone 7 is supposed to have a brighter display with more vivid colors, instead it is dim and washed out. I am contemplating returning it. This iPhone 7 Plus cost $870 (+ tax), it should be perfect! So what is the update ? what did Apple store tech person told you ? Did they replace it with anew phone or will change the screen? i just bought phone from du yesterday and have the same issue. Make sure Night Shift Mode is disabled first. Night Shift now is so much easier to by accident turn on in the Control Center with the much bigger button in iOS 10. That feature will yellow the screen out and depending on your setting could be drastic. Before playing with this other color correct feature, make sure to check Night Shift Mode. Ian got it right. When i updated a iPhone 6 to iOS 10 the screen went slightly yellow. Because i use Night Shift from 22:00 – 07:00 i checked the setting and i was right. Suddenly the Night Shift setting forgot that i prefer a speciel timeperiode where it is activated. In “general –> display and light” you can either deactivate Night Shift or adjust it to your liking. My iPhone 7 looks like night shift is stuck on. But it’s not. Bummer. I have exact same issue. Screen looks much much warmer than iPhone 6. It just doesn’t make sense. The ones in the store seem to be pretty much the same way too–very warm tint. I have to compare in full sunlight but I don’t see that the screen is any brighter either. Perhaps a software fix is needed. To all that are disappointed in the screen brightness of your ip7, besides checking your Display/ Night Shift settings, also assure that the Display/ Auto Brightness setting is enabled. This is now required to be able to access the full range of brightness without draining the battery (due to a user leaving brightness set too high). Results are best verified outdoors in direct sunlight. I have an iphone 7 with a yellow and dimmer screen compared yo my 6s. All the 7’s at my Apple store were yellower and dimmer too. Bummer. Keeping my 6s. I bought my apple 7 plus from apple directly. Not as bright as 6 plus. Went back to store to exchange and same problem. Returned the phone and went back to 6. I hope they correct this. Not happy about wasting a lot of time on it. My sister bought two iPhone 6s 32 gb from Apple store in Philadelphia. When I compare the screens mine looks dimmer and warmer. I guess they’ve put an iPhone 7 display on my 6s by mistake. Anyways her screen looks sharper brighter and better. the 25% brightness on iPhone 7 series can only be achieved outdoors under strong natural light and make sure that auto-brightness is turned on. My wife was experiencing this same problem, turned out it was just pressing the night shift button by accident. Easy fix for me. Hopefully it helps for others. I have an issue with the Front camera mode. During my camera use and FaceTime, if the light is dim, my screen image is green/yellow. Has anyone had this issue too? I have the exact same issue. I was starting to get mad, not I know Im not the only one. This fixed it about 80%. I hope that it is just the glue, and it will return to normal. Compared to my iPhone 6 the screen is very warm. Randomly I hit the “invert colours” toggle and when I switched back 2 seconds later the very yellow screen tinge had gone! Weird, I have to admit I was dreading trying to calibrate the screen colour to resolve the issue!! It is a bit no big deal for me yellow as well as my ipad pro 9.7 they look similar in color and FYI it is better for your eyes!! i have same issue. The screen color is like yellow. The apple customer service told me they ask their own engineers if it is a technical problem or not. Still waiting. My screen went yellow, I went to, general > accessibility > display accommodations > invert colors, the screen went blue then shot to black and went I disabled it, the screen went back to normal! I have the opposite problem. My i7 Plus is so blue. I had to use tint to warm it up. Warming it up actually matches my hardware calibrated display for photography. So your mileage may vary per display. The yellowish did lessen over time for my earlier ip6 and ip6+ and I hope my new ip7 gets better. IMHO, the best retina display would be my ip4 wheb compared with the rest of the current offerings. Changing the tint would also make it better. I have the same problem. Tweaking the color tint doesn’t really help. I have a whole thread about this at the Apple support forums. Oh my word, thank you so much. Now my phone (iPhone 6 plus) is much more brighter and color is stronger. I played around with it, switch the “invert color” on and then off…goes bck to full white..weird. Don’t worry too much about warm screen tinge. You will get used to it. After getting used to it your eyes will see it as the new norm. You start to see cool tinged screens as overly blue. Wish I had googled this before… Spent a whole day at Apple and ATT to get a new phone that still had a yellow tint. Any reason why Apple or ATT doesn’t offer this as a fix? Could have saved me so much time. Wow, my iP7+ was suddenly yellowed today. I found this article, but instead, i toggled “invert colors” on, off, and it fixed it! I did t even have a chance to try anything else. Perfect! I replaced my damaged iPhone 7 screen myself and the colors, especially the green iMessage app we’re dull. it actually worked! this is worth sharing!